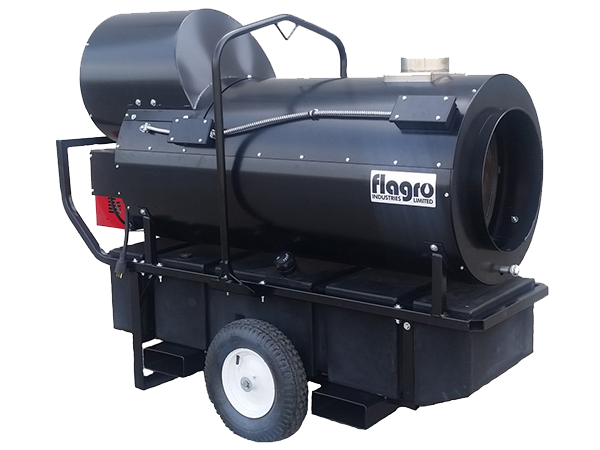 Flagro introduces the newest addition to their indirect fired heater line up, the FVO-400RC. This new model provides 400,000 btuh of clean, dry heat directed through a 16” duct outlet. The reverse inclined fan design allows for the heat to be ducted up to 150ft at a true 3500cfm. The new motor and fan design are quiet and draw under 7amps, allowing for forgiveness with the job site electrical supply. The recirculation hood installed on this heater allows for the already warm air inside the building to be used for combustion, thus saving on fuel costs. Also included on this new model is the Riello nozzle pre-heater which ensures cold weather start up. Unlike fuel reservoir heaters, this nozzle pre-heater receives heated fuel right at the point of ignition raising the temperature of the diesel fuel and preventing “fuel gelling”. Other features of the FVO-400RC includes 16” ducting inlet and outlets, fork lift pockets, lifting harness, voltage meter, and optional “Tiger-loop” fuel system providing single line and remote fuel tank capabilities. Proven features used on all Flagro indirect fired heaters such as a fully welded stainless steel heat exchanger and a Riello burner are included on the FVO-400RC to make certain it will be as solid and reliable jobsite performer.